The kiddie pool at South Park in the City of Greenville was closed several years ago. In 2020, residents may have a new reason to go the park when a splash pad is installed. GREENVILLE – An upgrade to the city’s South Park has been batted around for a few years, but that idea may soon become a reality thanks to a grant from the Ohio Department of Natural Resources and a donation from the Wayne Hospital Foundation. 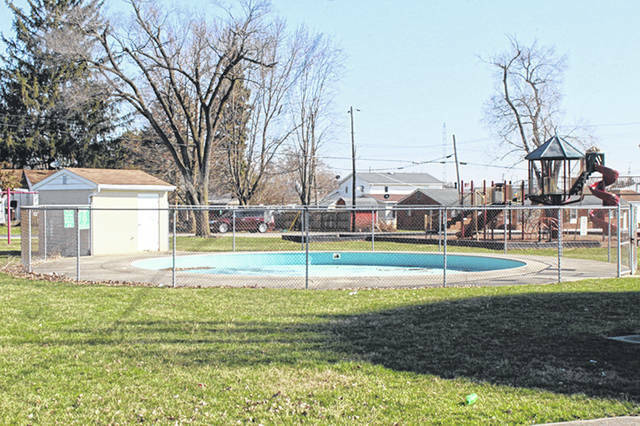 The kiddie pool at the park was closed several years ago, but in the summer of 2020 kids in the neighborhood may have a place to go cool off and enjoy the water. On Tuesday, Safety Service Director Curt Garrison told Greenville City Council the city was approved for a $273,769 land and water conservation grant from ODNR for the installation of a splash pad at the park. The Wayne Hospital Foundation has agreed to provide $225,000 toward the project, and the city will be responsible for $50,000. In addition to the splash pad, the city would make several upgrades to the park. Garrison said the city also would renovate the former recreation building and add new restrooms. The old restrooms would be used as the control room for the splash pad. The city also would add a parking lot. Garrison said there was a lot of engineering to be done before the city could break ground, which is why the splash pad won’t open until 2020. Council provided some confusion during its meeting when it approved a Utilities Committee report by a 4-2 vote, offering city water and sewer to a property outside the city limits owned by Geoff Surber. During Call of Council, Councilman Clarence Godwin asked to revote on the original motion. A seldom used rule allows a person on the prevailing side of the original vote to ask to reconsider the motion – if done so by the end of the meeting. On the second vote of the committee report, the motion failed 6-0. Councilman John Hensley said new information came to light after the committee’s report was submitted. During the public hearing portion of the council meeting, Greenville Township Trustee Justin Hines said the township trustees would approve the annexation process for the property if Surber would submit an application. The property on Sater Street is surrounded by the city limits. Hensley brought up the issue with the Erwin Brothers. The Erwin Brothers rejected the city’s demands in the pre-annexation agreement and chose to seek a different avenue to get services, which included a well and septic system. In other business, council learned the We are the Majority organization will participate in the Global Day of Service, April 12 and 13, in the city and has received grants to complete the projects. The group will be joined by Citizens for Safer Streets to install a flowerbed near the East Main Street bridge walking path and doing landscaping at the entrance signs to the city and the park. Reach Ryan Berry at rberry@aimmediamidwest.com or 937-548-3330. This entry was tagged grant, Greenville, Greenville City Council, ODNR, Ohio Department of Natural Resources, South Park, Splash pad, Wayne Hospital Foundation. Bookmark the permalink.